We caught up with Kristen and here is what she was able to share about herself and her work. How long have you been a boro artist? I have been working with borosilicate glass for about 3 years. I started learning with soft glass and quickly moved to borosilicate (I’d love to delve more into soft glass one day). Why did you chose glass as a medium? I have always made art. I starting with drawing and moved onto painting then to clay and eventually to bronze. I still love working in all of these mediums, but glass has my interest the most. I learn something new and expand my skills every time I get on the torch and I love that. It’s such a wonderful challenge. I love putting 100% of myself into something every day. Yoga and aerial acrobatics have become a huge part of my life over the last few years. 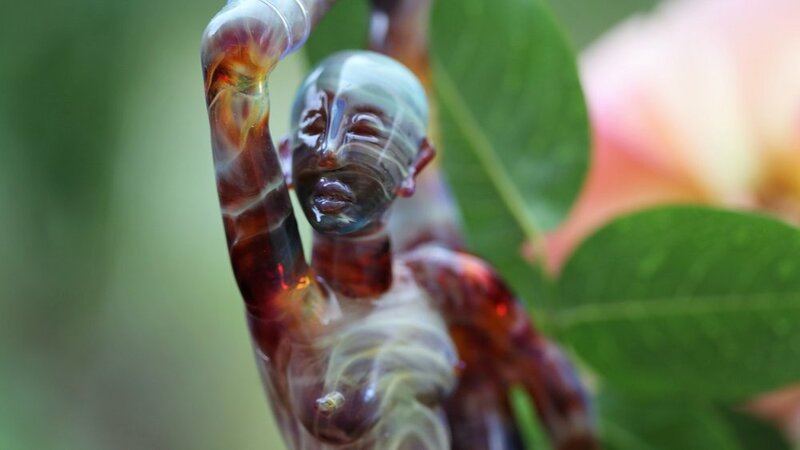 Yoga is a wonderful balance to glass blowing as creative outlet and a physical one. I love losing myself in a flow and I want to capture those emotions in glass. Tell us about the deer rigs, they are fantastic! (you can see them on Instagram here.) Thank you! One of the things that really relaxes me and makes me happy is being in nature. The first thing I thought of when I wanted to do a series about nature was deer. There were deer around my house all the time as a kid. I have this totally childlike version of a deer in my head from when I was little that looked like a forest spirit. That and I always thought their antlers looked like trees so I really enjoy putting trees that I grew up around as their antlers like cherry blossoms. That fluctuates pretty often because of how much I love color but my current is any yellow or orange. Another longstanding favorite is blue. I love working with contrasting colors and watching how they work together. That is one of the reasons I love Momka’s multicolor rod. What is next? What can you tell us that we can expect from you in the future? I can’t wait to show you guys where I want to take my art. Every piece I learn something new and make something more and more complex. I’m getting closer to making the pieces in my head and in my sketchbooks! I want to make multi part pieces that could sit comfortably on a shelf or on the wall as an art piece and no one would know you can smoke out of it. I am beyond excited for what the future holds. Thank you again for the opportunity to be in your showcase!